There’s more to do on Cres than just stay in your camp. Why not explore the Cres island towns and find out more about this island’s rich culture? A town on the island of the same name and the second largest town in the Cres and Lošinj Archipelago. Once called Crepsa, it has been inhabited since the Illyric times and was important for its good harbor, natural environment and the close proximity to Istria. The Venetians had the greatest impact in the 14th century. Their influence is clearly visible in the numerous churches, palaces, town gates and towers that you will see while walking along the narrow streets and alleys of this small North Adriatic town. The most impressive thing about this historic village is its position. It is perched on as 378-meters-high cliff providing a view of its popular pebbly beach and the coast of Istria. Its wonderful architecture and plenty of chapels, its unique position, the steep cliff overlooking the sea and special house designs are fascinating in themselves. The concerts during the summer season are the highlight of the cultural offer. According to a survey conducted by the German Bild magazine, the pebbly beach at the bottom of Lubenice is among 15 most beautiful beaches in the world. A seaside fishermen village situated between two pebbly beaches. 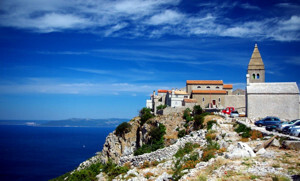 It is popular because of the Austrian TV series ‘’Meet the Sun’’ which was filmed in Valun and the island of Cres. Valun is only accessible on foot. Its small harbor and houses leaning on each other with numerous bars and shops invite us to stop for a while. This fishermen’s settlement is only one kilometer from Camp Slatina. A pleasant promenade takes to a lovely harbor from Tiha Bay. You will find pleasant restaurants, bars, a grocery store, and post office and a tourist office. As this village is located on an elevation, a sea view is provided all around. Punta Križa is an intersection of village routes leading to various shepherd settlements. As it is far from the main road and it only accessible by a narrow winding road, peace and rest are guaranteed. You will experience nature in a wonderful littoral oak and holm oak forest and see some wild animals. Naturist Camp Baldarin is 3 km from Punta Križa.